An idyllic, dramatically positioned retreat with all the right ingredients to exceed your expectations. Designed by the famous French architect Marc Held and set in one hectare of land, Maistros could be said to have it all: breathtaking sea views, private access to a beach, a heated pool, chic, high quality furnishings and even an adorable donkey, Kukulitza. Add to this the dedicated, welcoming staff and your holiday will want for nothing. ¹ 4 hours daily in the morning. Inside: accommodation at Maistros is spread over three separate buildings – the impressive main house and two smaller guesthouses– the Kalivi and the Studio. The main entrance takes one into the indoor dining area, whose wood-covered walls and white-painted vaulted ceilings give one the slight sensation of having boarded a luxurious boat. This feeling is confirmed as one heads into the long well-equipped kitchen with its banks of windows, high ceilings and large range cooker. The dining room also flows into the voluminous living area, which has two separate sitting areas, one gathered round a fireplace, the other a built-in sofa following the contour of one of the room's corners. Numerous windows bring in the light and the sea views, white-painted brick walls give way to an impressive wood-beamed ceiling, and doors lead out on to the wrap-around, shady decked terrace. Off the left of the living room is a small bedroom with bunk beds, en-suite shower room and access to the surrounding terrace. Next to this bedroom, a spiral staircase takes one down to the lower floor, which is home to the main sleeping quarters of the main house: a large master double with a unique en-suite bathroom with tub and separate shower, a twin bedroom with en-suite shower room and a further bunk-bed room; also with en-suite shower room. Both the master bedroom and the bunk room have their own independent access to the surrounding gardens. The fifth bedroom of the main house, a double with a small en-suite shower room, is accessed externally from the lower floor terrace. Accommodation on the lower level of the main house is completed by a sauna. The Kalivi, meaning ‘small farm’ in Greek, is the smaller of the two guesthouses. It is situated about 80m from the main house and comprises a bright double bedroom, en-suite shower room and a terrace with spectacular sea views. The Studio, the second guesthouse, comprises a voluminous double bedroom with curvaceous free-standing bath and a sitting area, and an en-suite shower room. It too has its own tranquil terrace looking out to the property's luxuriant gardens. Outside: the extensive grounds of Maistros occupy around one hectare of Skopelos' achingly beautiful coastline. The houses nestle amongst a shady canopy of Mediterranean pines, cypress and olive trees and from the outside the main house has something of a tropical lodge about it. A wide variety of panoramic sitting areas dot the grounds, meaning that guests can spread out and find their own favourite spot for reflection, contemplation, reading and view-watching. Running round three sides of the main house is a decked terrace furnished for dining and relaxing. Steps lead down from here to a circular, fabulously panoramic terrace, which will possibly become your spot of choice for aperitifs and long dinners under the stars. On the fourth side of the main house is a vine-shaded al fresco dining area served by a wood-fired oven. A short walk from the main house and close to the Studio is the inviting gated and heated pool, surrounded by sun loungers and shady corners. Most of the bedrooms in the main house have their own independent access to the gardens and it is from the viewing point near the master bedroom that one may begin one's descent to the beautiful sandy-shingle beach and transparent waters below the house. While heading down the 375 steps, devotees of Mamma Mia! the movie might notice a familiar sight in the distance: the chapel of Agios Ioannis, setting for the famous wedding scene. No other houses have access to the beach below Maistros, though boats may occasionally drop anchor there. The final 2km of the road to Maistros is unpaved and rather bumpy, so a 4-wheel drive car is essential. Due to Maistros' location on the island of Skopelos and the limited number of hydrofoil/ferry connections between Skiathos and Skopelos (which might occasionally delayed or cancelled due to bad weather), we recommend that you book your flights to arrive either the day before your stay at the villa or in the morning of your arrival day. Similarly, for departure, we recommend you book either a late flight or a flight on the day after leaving the villa. Maistros perches on the high cliffs of northeastern Skopelos, just a few kilometres from the charming village of Glossa, whose whitewashed streets and shady square offer great views and a variety of amenities, including shops and tavernas. Picturesque Skopelos Town and harbour, situated in the southeast of the island, is about 40 minutes' drive away. 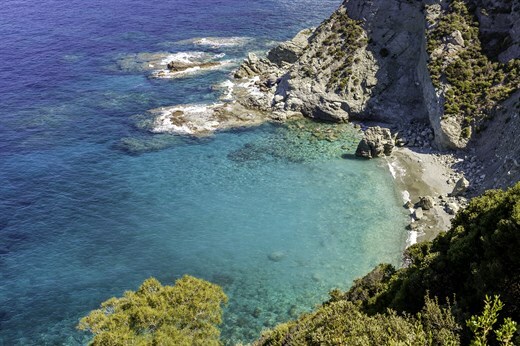 Skopelos island is the perfect size to explore in a week or two and offers a good range of activities. A variety of beaches are dotted all around the island's nearly 70km of coastline. Some, such as those in Skopelos Town, Panormos and Limnonari are easily accessible. Others can be reached only on foot or by sea, an excellent excuse for hiring a boat for a day or two and exploring the island's gorgeous coves and bays. Skopelos is also a green and pleasant island, and the vibrant colours, heady fragrances and cooling shade of its pine and oak woods contend with the multi-blue-hued sea for visitors' attention. There are several good walking trails across the hilly interior, whose two main peaks, Mount Palouki and Mount Delphi rise to 546m and 681m respectively. You will come across numerous monasteries on your way, as well as some superb views and a few sleepy villages where time seems to have stood still. One walk will lead you to the chapel of Agios Ioannis, which enjoyed its 5 minutes of fame as one of the locations for the film Mamma Mia! Alonissos island: a 30-minute hydrofoil crossing from Skopelos Town or a 1hr10 hydrofoil crossing from Loutraki harbour. "Maistros is stunning - loads of space, amazing location, lots of character. We particularly enjoyed the view, the sitting room, the staff, the solitary beach and Koukalitsa the donkey!" Maistros is a fantastic villa. Maistros is stunning - loads of space, amazing location (the steps to the sea were worth it), lots of character. We particularly enjoyed the view, the sitting room, the staff, the solitary beach and Koukalitsa the donkey! The staff were fabulous and definitely added to the enjoyment of our stay - nothing was too much for them and all done with a smile. We didn't venture out much because the villa was so lovely. The in-villa cooking was fantastic - fresh and tasty - and definitely worked out financially for a big group. The groceries delivery was an unexpected bonus - the housekeeper organised all this for us whilst we sat eating a delicious breakfast she had already prepared. For groups of weary urbanites looking for the ultimate restorative retreat Maistros is the perfect place. It’s a highly sophisticated idyll far off the beaten track. The walls are lined with books, there’s music on vinyl, 1950s black and white photographs, and the kitchen is equipped with up-market gadgets for foodie enthusiasts. But first and foremost this house is all about the location and the stunning views. Blue skies and sparkling seas lift the spirits and make the city feel a long way away. Throw open the French windows and the sea is all around. Steps lead down to a beautiful circular terrace, perfect for long lunches and cocktails at sunset. There are multiple shady spots for reading, snoozing or (in our case) playing the flute. Great views abound. Steps lead down to a private beach – which is totally secluded and completely unspoilt. The water is crystal clear and we spent happy hours swimming and snorkelling. The climb back up ensures a good appetite for lunch and the swimming pool is the perfect place to cool down any time during the day. Everyone returned from this beautiful house feeling restored and reinvigorated, and we still talk about the lasting good effects from our holiday.